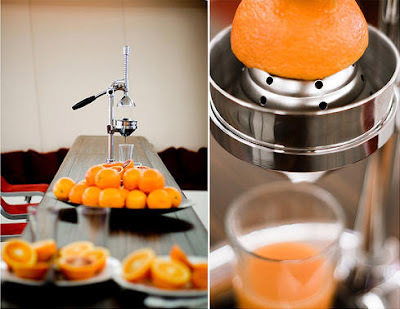 With nice and brigh colors, orange juice is so wildy loved and fun to make. -Also known simply as "OJ"
My Mom used to do it in the summertime to erase and prevent sun damage, but I feel it can be used in winter time, too, to revive glow and lightly exfoliate a dreary winter skin. The recipe is simple: an orange juice. That. 's right. Plain orange juice. My Mom rubbed half the orange or half the tangerine (or clementine, or even satsuma) all over her face, avoiding the eye area. And it makes perfect sense: orange juice contains alpha hydroxy acids, and just the right type for your skin. Even the most fragile skins are safe with most fruit juices, apart from lemon and lime. Still, you can use them diluted.